The year 2014 - Where is the option to install from USB? Home > Forum > General Chat > The year 2014 - Where is the option to install from USB? I've been using zfsguru on and off since a couple of years now, and I like it and I am very happy that jason have made it available for this "community", to use his own creation. I'm not however very fond with how users have to install it. Why do http://zfsguru.com/doc/quick still refer to using a CD as the main installation medium? Two MAJOR open source/free software projects (pfSense and NAS4Free) are based on FreeBSD and they both offer the option to install from USB. I've put myself in the position that I don't have access at home to anything related to the CD/DVD area and that have worked pretty well since -07 or -08, except from a couple of cases, one which is related to installing zfsguru. I bet this will hurt in some eyes that I, a simple end user complains about something which I'm not even contributing to myself. But let's face it, this community is growing and thus the demands will actually change. You are right; installing using USB should be easier. But you can already install from USB. You can boot ZFSguru inside a Virtualbox machine and pass your USB-stick to the virtual machine by clicking on the USB icon and selecting the USB stick. Then ZFSguru should 'see' the USB stick as normal harddrive. Install ZFSguru on that drive as you would normally do. Now exit the Virtual Machine and cleanly detach the USB stick. 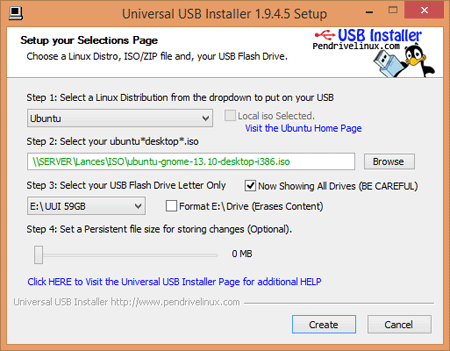 Now you have a bootable ZFSguru USB stick which can be used to perform another installation. You can download whatever image you like and install that using the web-interface. It is a USB 3.0 external enclosure, without harddrive which you buy separately. I do appreciate that you're taking your time to answer me, I do. But dude, easy is not done by installing a VM software first, then booting and installing zfsguru to the USB stick that I've passed through to the VM. And buying additional hardware aint something done in 5 min either. I know but currently that's all ZFSguru has. It is still in development, the true Embedded distribution designed for USB sticks and flash media, is not yet working. Just a heads up , i had major problems with the method of installing via USB ( VM , mount USB and so on....) install would hang at the last point, if i manually made the disk bootable it would work but no services would start and i could not enable L2ARC. Went out and got myself an external DVD drive and all is well now :) ( i need the drive anyway to backup my 100 or so DVDs to the server). According to Ciphers post about it, it seems to be USB 3.0. "t is a USB 3.0 external enclosure, without harddrive which you buy separately." What about unpacking the .iso onto an USB stick and setting USB as bootable in the bios ? I have some early news, to be announced soon by Jason: creating a USB stick now works. Including with EFI boot which is awesome. Soon, you will be able to create your own ZFSguru USB stick using a small Windows program that writes the USB image to your USB stick. Quick and painless. Probably it will be available at around the time the new version (0.3) is released. Hey CiPHER that drive is just what I was looking for, I just ordered one. The option to use multiple ISO's is like having a collection of real DVD's and CD's in just one small package. GREAT! Thanks for the tip. Yes i'm very pleased with it. Edit: with ODD i mean Optical Disk Drive - like CD/DVD/BluRay. - the ODD-emulator will only accept FAT32 or NTFS filesystems, on a MBR-partition scheme. GPT not supported! - i had some problems with Linux writing to the NTFS filesystem, where the ODD-emulator did not accept the .iso image. - you need a USB port capable of delivering enough power to spinup a harddrive. Your regular USB ports from the motherboard should be good; but some USB hubs and such might not be suitable. This applies to basically every external harddrive solution that draws its power from the USB port. But that is really all and it works just great in everyday usage. I'm very pleased with it as i never have to burn a CD again and .iso's are still very universal. I have Ubuntu Linux, Memtest86+, diagnostics and of course ZFSguru on there. Definitely pleased with my purchase. From and to a USB drive! It worked great for me, efi boot indeed.